Yo-yos have been around for centuries, but it was truly a fad in the 1950's culture but this toy is till used today. Come read about the history behind this fad presented by oldetimecooking.com. Even in ancient Egyptian temples, drawings of objects have been seen in the shape of yo-yos. Historical records indicate that 16th century hunters in the Philippines hid up in trees and used a rock tied to a long cord, up to 20 feet in length, to throw at wild animals beneath them. The weapon was able to be pulled up and thrown back down for multiple attempts at the prey. This gave rise to the widespread idea that the practice was the true forerunner of the yo-yo, but this is a stretch of imagination and has no real basis in fact. It is extremely likely, however, that the yo-yo did travel from China not only to Greece, but also to the Philippines, where the yo-yo is known to have been a popular toy for children over a very long period of time. In France, a painting dated to 1789 shows the 4 year-old, future King Louis XVII holding his lemigrette. It was during this time of the French Revolution and the "Reign of Terror," that many of the French aristocracy were forced to flee to Paris, Germany and across other borders when their style of life was threatened by the peasant uprisings, taking their popular yo-yos made of glass and ivory with them. Lemigrette is a French term meaning to leave the country. Another nickname for the yo-yo at this time was de Coblenz, which was a city to which many French fled. These names reflect an important historical connection between the toy and the French Revolution. The yo-yos value as a stress reliever is also seen through history. While being a fashionable toy for the French nobility, those less fortunate are said to have played with their emigrettes to reduce the understandable tension of their one-way trip to the guillotine. Dating through the 1780s, there are drawings of General Lafayette and others with their troops flinging their yo-yos. The yo-yo arrived in Paris in 1791 as it spread through France and was called the "joujou de Normandie." Some believe that this term may reflect possible roots for the modern American name of "yo-yo." High interest in the toy continued as evidenced by the famous French playwright, Beaumarchais, in his treatment of "The Marriage of Figaro" in 1792. There is a scene where the nervous Figaro enters and conveys his tension, not by the conventional wringing of his hands, but playing with his emigrette! When asked what the emigrette is good for, Figaro responds, "It is a noble toy, which dispels the fatigue of thinking." Even on June 18, 1815, at the famous Battle of Waterloo, Napoleon and his army are known to have been seen relaxing with their yo-yos before battle. The yo-yo craze traveled throughout Europe to England by way of Scotland and France. The English used the French word bandalore, the term quiz, and the word incroyable which means a French dandy, to identify the toy. In 1791, a print was circulated of the Prince of Wales, future George IV, whirling his bandalore. Because of the toys popularity as well as the princes power to sell, the toy also became known as the Prince of Wales toy and soon became a toy that any person of fashion had to own. The toys ongoing popularity in England is shown as late as 1862 when an illustration appeared showing two young lads terrifying an older woman with their quizzes. The first recorded reference to any type of yo-yo in the United States was in 1866 when two men from Ohio received a patent for an invention called "an improved bandalore," in that it was rim weighted. One year later, a German immigrant named Charles Kirchof patented and manufactured the return wheel. From then until 1911, although various patents were awarded in the United States related to the yo-yo, nothing notable occurred. In 1916, the Scientific American Supplement published an article titled "Filipino Toys" which showed it and named it a yo-yo. This was explained by some as the Filipino word for "come-come" or "to return." Significant events were soon to happen in the United States. These yo-yos were hand-carved from a single piece of wood. The yo-yo was unique because it was the first yo-yo that did not have the string tied to the axle. Instead, the string was looped around the axle, allowing the yo-yo to spin or "sleep" at the end of the string. This concept is at the heart of yo-yoing today. Rather than being able to only go up and down, the yo-yo was now capable of doing an infinite number of tricks. In 1928 or 1929, a businessman named Donald F. Duncan Sr. saw his first Flores yo-yo while he was in San Francisco. He saw the potential of the toy as he witnessed the crowd that Pedro was able to draw by doing a few tricks. He purchased not only the idea of the yo-yo, but the Pedro Flores company itself. And, as they say, "the rest is history." Donald Duncan was an excellent businessman. He developed advertising campaigns and had demonstrators working for him in the U.S., as well as Western Europe. "Duncan Yo-Yo Professionals" traveled throughout the United States teaching and demonstrating yo-yo tricks and conducting contests in an effort to promote sales. Competition grew as other companies began to see the toys potential. 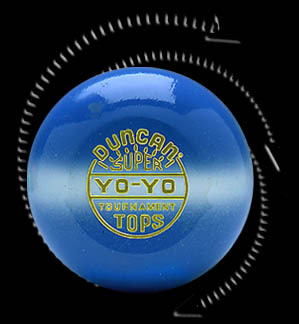 In 1932, in an effort to protect his interest, Duncan filed for and was assigned a trademark for the word "yo-yo." Not able to use the term "yo-yo," competitors were forced to use terms like "come-back", "return", "returning top", "whirl-a-gig", and "twirler" for their versions of the toy. In 1946, the Duncan Company moved to Luck, Wisconsin, which quickly became known as the "Yo-Yo Capital of the World" producing 3,600 yo-yos per hour. They produced the original maple wooden yo-yos using 1,000,000 board feet per year. In 1960, plastic yo-yos that we still see today began to be manufactured. Sales grew and grew. By 1962, the Duncan Company alone sold a record 45 million yo-yos in a country with only 40 million kids, and still could not keep up with the demand. High television advertising expenses and excessive expenses in overtime wages and materials to keep up with the demand hurt profits. There was also the continual legal expense in trying to hold onto the trademarked word "yo-yo." Competitors fought hard to use it in describing their products. 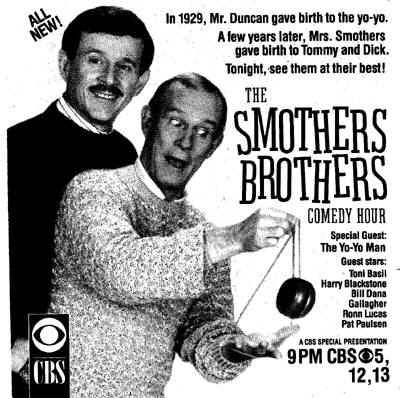 Finally, in 1965, the Federal Court of Appeals ruled that Duncans trademark for the word "yo-yo" was no good. The term yo-yo had become so widespread that it was now a permanent part of the language and it no longer only described the toy. It, in fact, WAS the toy.